I’ve worked with Bootstrap a lot since the 2013 release of Bootstrap 3.0. I’ve contributed to the Bootstrap docs, and rank first for Bootstrap on Stack Overflow. I feel more than prepared to tell you everything you need to know about it. With this article, I hope to demystify Bootstrap in a clear and understandable way. BUT First, let’s talk about you. I hope that if you’re reading this you have a good understanding of HTML and CSS. If you haven’t built any Websites, don’t know what CSS Specificity is, or don’t know the difference between using #abc and .abc in CSS, this is NOT the article for you. Instead you should learn the basics of HTML and CSS. I hear ya. You’re not alone. I’ve answered over 2,000 Bootstrap related questions on Stack Overflow, have seen many frustrated Bootstrap users. Do yourself a huge favor: Read this article, the documentation, and don’t try to force things. I will show you that Bootstrap is easy, elegant and sensible. What is Bootstrap and Why Would I Use It? From here on, this article can be read on an as-needed basis. Feel free to scroll past sections that are glaringly newbie to you, but please don’t overlook the important details that will help you utilize “Bootstrap the right way”. What is Bootstrap? Why Would I Use It? Consistent__ Foremost, Bootstrap provides a consistent, uniform appearance and design. With very little effort, Bootstrap can be used to transform a hodgepodge site into a professional, visually appealing design. Responsive__ Sites created with Bootstrap are designed to look & function well on any device including desktops, laptops, tablets and smartphones. Bootstrap is “mobile-first” which means the design for smaller mobile devices is considered before that of larger screen devices. Responsive-ness is based on screen width, not height. This is because Bootstrap utilizes width-based CSS Media Queries. Compatible__ Bootstrap is a mature, tested code-base that is entirely based on standards and cross-browser compliance. Sites that properly utilize what Bootstrap offers will also benefit from this compatibility. If you don’t understand what I’m talking about, that’s okay! Let’s look at a super simple Bootstrap example. A Basic “before & after” Bootstrap example. This would have been fine for this simple example. But, for more complex pages would I want to keep writing CSS classes for every style change that is needed? Would that CSS be re-usable, and tested across multiple browsers? Would I want to add CSS definitions to make the design “responsive” for different device widths? The likely answer is “No”, and that’s why I’m here writing about the very popular Bootstrap. How to Get Started with Bootstrap. Some people will ask or explain “How to install Bootstrap”. Well, you don’t really “install” it. Using Bootstrap is a matter of referencing the appropriate CSS and/or JS files. You might have a build process or development environment that utilizes tools such as NPM or Nuget in which case you’ll want read the docs on adding Bootstrap and its’ dependencies. For this article, I’m going use Bootstrap 4 on Codeply since the Bootstrap files are automatically included in Codeply’s editor. This is the fastest option if you’re looking to quickly get started, learn the basics, and prototype Web designs using Bootstrap. How to Use Bootstrap CSS. Layout helpers with “rows” and “columns”. Reminder: If you don’t know what “CSS Specificity” means, or don’t know the difference between using #abc and .abc in CSS, this is NOT the article for you. Instead you should go back to basics. This article will show you “How-to Bootstrap”, but isn’t meant to teach you basic HTML and CSS. Now I’ll explore all of the “tools” that Bootstrap provides to “make Website development faster and easier”. How to Use Bootstrap CSS “Styles”. Remember that simple Bootstrap example I showed you earlier? First of all, the Bootstrap CSS includes Reboot which “normalizes” the Web page styles. Web browsers have different, somewhat ugly, styles that are applied to Web pages by default. Since each browser’s defaults are a little different, Bootstrap uses Reboot to override the browser defaults, and provide the same “elegant, consistent baseline” to build upon, regardless of the browser. This means that if the Web page is viewed on Safari, Chrome, Firefox or IE it will start out with the same baseline CSS styles. No one gets too excited about a Web page that lacks color. Color is often used to convey meaning, and highlight specific page content. Bootstrap provides 8 contextual colors that can be easily applied to HTML elements. You’ll see that colors are named to convey meaning. Additionally, Bootstrap CSS can be used to style and format any page content such as Tables, Forms, Images and Figures. As you can see in the picture above, the “Primary” button has a different color than the normal Bootstrap blue color. That’s because this Web page also includes a “theme.css” stylesheet after the “bootstrap.min.css”. The CSS styles (or rules) defined in “theme.css” are overriding the default Bootstrap CSS styles, such as the definition of the .btn-primary color. I will explain Bootstrap theming and customization a little later in this article. 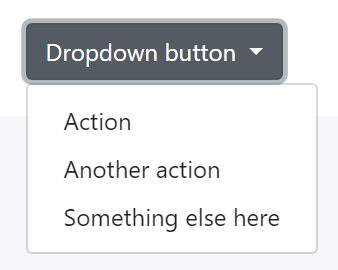 Let’s look a little closer at how I used Bootstrap’s “Primary” button. _Why does the button have 2 classes: .btn + .btn-primary? This base-modifier approach in Bootstrap’s CSS makes customizing Bootstrap much easier which I will explain later in this article. 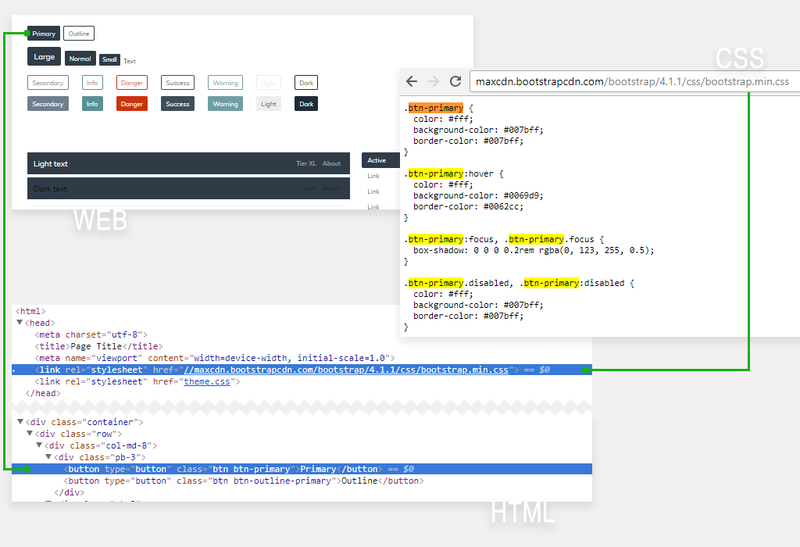 _How do I know the correct HTML markup & structure to use for Bootstrap Components? This is where developing with Bootstrap does require some “leg work”. The CSS toolkit is there at your finger tips, but you do need to know and use the correct HTML structure when utilizing any of the Bootstrap Components. 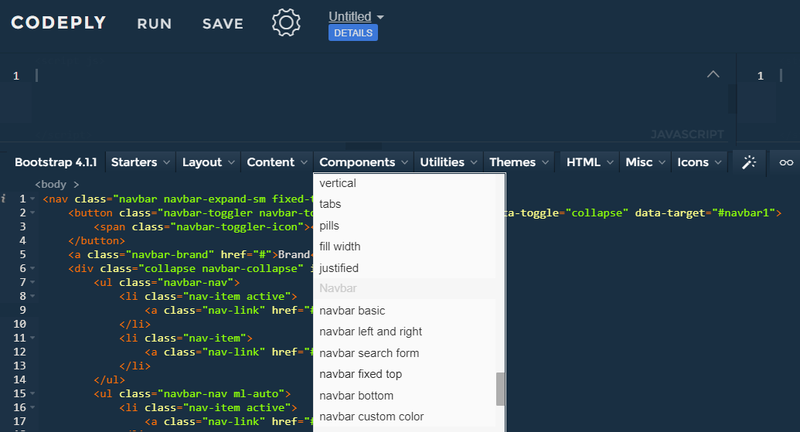 When using Components like the Button (.btn .btn-primary) shown earlier, the HTML markup is straight-forward. But, for other Components like the Navbar, Modal or Carousel, determining the correct HTML structure is more complex, and will vary according to use-case and the desired implementation. When using these more complex Bootstrap Components, you must start with examples. The best resource is the Official Bootstrap Documentation. The docs have many examples, and a “How it Works” section for each Component. While most of the Bootstrap Components are self-explanatory and well-documented, I think the Navbar requires a full explanation. Along with the Grid, the Navbar is one of the most popular Bootstrap Components. 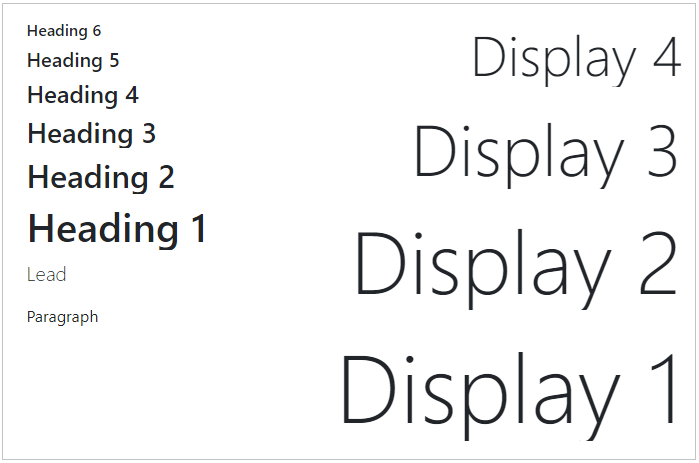 Check out this Codeply to see the different Navbar breakpoints. The Navbar uses the navbar-light and navbar-dark classes to determine the foreground colors of the brand, links and toggler (hamburger) icon. Make sure you use the appropriate classes to make the Navbar content display. To give the Navbar a background color, use one of the contextual colors (e.g. bg-primary) otherwise the Navbar is transparent. Of course, Bootstrap is the Swiss army knife of the Web design & development world. Bootstrap encompasses many widely used CSS properties in handy “utility” classes. This eliminates the need to write the same CSS over-and-over again to apply styles to different HTML elements. You many know it as D.R.Y. Now that you understand the basics of using Bootstrap’s styling Components, next I will explain Bootstrap’s powerful, responsive Layout Component__ the Grid system. The Bootstrap Grid System is used for layout, specifically Responsive Layouts. Understanding how it works is vital to understanding Bootstrap. The Grid is made up of groupings of Rows & Columns inside 1 or more Containers. Note: The light gray border lines around the columns in the examples above were added so that you can visualize the outline of each column. See the working layouts on Codeply. __Why do I need a Container? __Can I make one Column wider than the others? Columns must be the immediate child of a Row. Rows are only used to contain Columns, nothing else. Rows should be placed inside a Container. Those rules are very IMPORTANT. The Rows & Columns always work together, and you should never have one without the other. Bad stuff will happen if you don’t follow those 3 simple Grid rules, exactly. I’ve answered countless Bootstrap questions on Stack Overflow by simply applying those rules. At first this might sound complicated, but it’s really easy once you understand how the Grid works. How to Use the Bootstrap Grid __The Right Way. In the basic example before you may have noticed that I used the .container to wrap the .row. The Container is the root (a.k.a: top-level, outermost) element of the Bootstrap Grid. At first, the Container may seem trivial or unnecessary, but it’s very important to control width of the layout. The Container is also used to evenly align the left and right edges of the layout within the browser’s viewport. FYI: Viewport — The visible area inside the browser window. The .container scales down in width responsively (as the screen width narrows) so that eventually it becomes full-width like the .container-fluid on smaller devices. When utilizing the Grid, one more Rows will be placed inside the Container. You can have multiple Rows in a Container, and you can have multiple Containers on one page. It all depends on what layout you’re trying to accomplish, but don’t get too concerned with that yet. It’s important that a Container is used to contain grid Rows (.row). Rows have a negative left/right margins of -15px. The Container padding of 15px is used to counteract the negative margins of the Row. 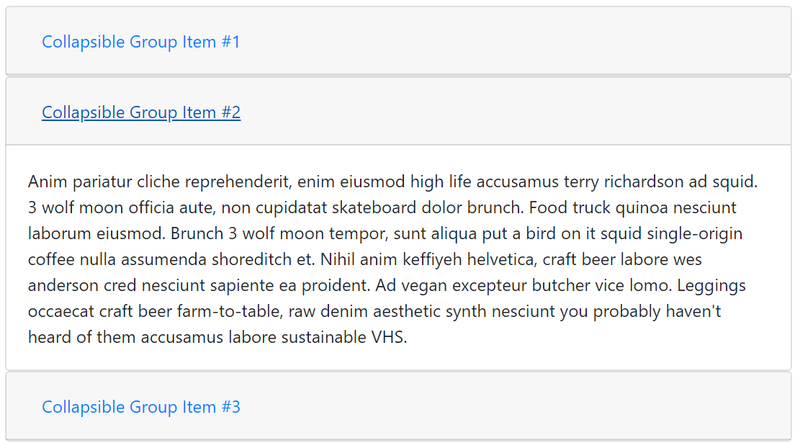 If you don’t put a Row in a Container, the Row will overflow it’s container, causing an undesirable horizontal scroll. For a while now I’ve wished that the Bootstrap .row wasn’t actually named “row”. The name “row” is often misleading, and obscures the actual purpose of the .row. When you think “row”, you probably think horizontal line, which is okay, BUT, it’s better to think of the .row simply as a parent of columns. This is because columns inside the .row aren’t always laid-out horizontally across the viewport. Some times we want the column layout to be horizontal, while other times we want the columns to layout vertically down the viewport. The concept of horizontal vs. vertical layout is the essence of Responsive Design. The sole purpose of the “row” is to contain 1 or more “columns”. DON’T PUT CONTENT DIRECTLY INSIDE THE ROW! This is very bad, wrong way, no bueno!! Columns, and only columns, are placed inside the Row. Content is placed inside the Columns. It’s also important to mention that the .row is display:flex. 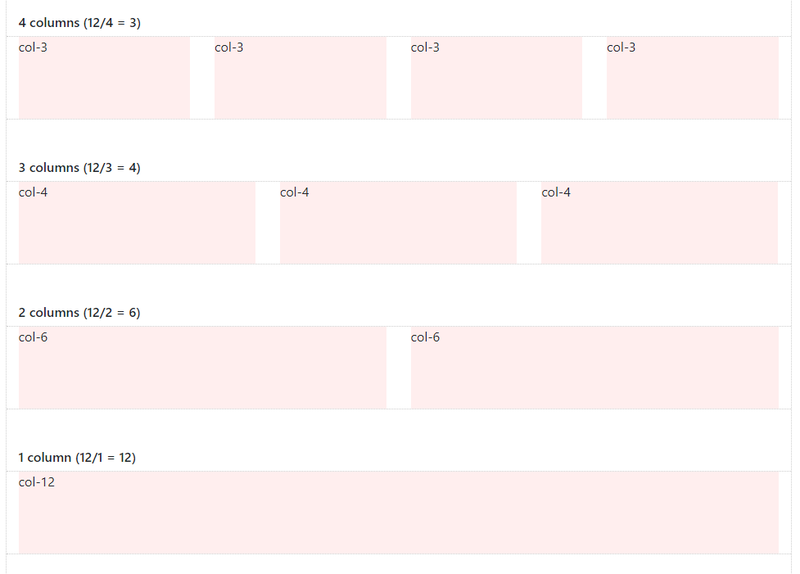 As Flexbox children, the Columns in each row are the same height. Because of Flexbox, horizontal and vertical alignment (align right, center, bottom, etc..) is easily accomplished using Bootstrap 4’s Flex and Auto-margin Utility classes. Now it’s time to look deeper at Rows & Columns, and exactly how they work together. 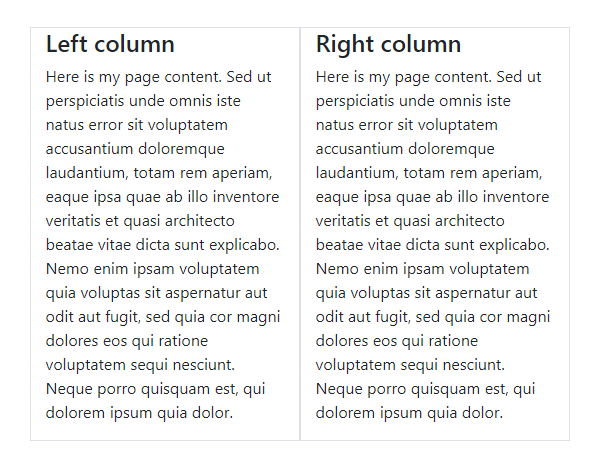 There are different “types” of Columns, and different ways to use them in your layout. They are like magic. Create horizontal divisions across the viewport. Can have different defined widths. Can change in width at different screen widths. Layout horizontally left-to-right, then vertically up-and-down. Can change position (re-order) relative to siblings in the same row. Are the same height as other siblings in the same row. Can “grow” or “shrink” in width. Can automatically “wrap” or “stack” vertically as needed, or at different screen widths. Can contain more Rows & Columns__ nesting. All you need to know about Bootstrap Columns. Just dont’ forget that columns must be the direct child of a Row. Columns create horizontal divisions across the viewport. The space between the columns is called the “gutter”. The columns can be split-up using any part of the 12 units. And, it’s okay to use less than 12. It’s also okay to use more than 12 which I’ll show you later. But, the Grid is not always about 12. 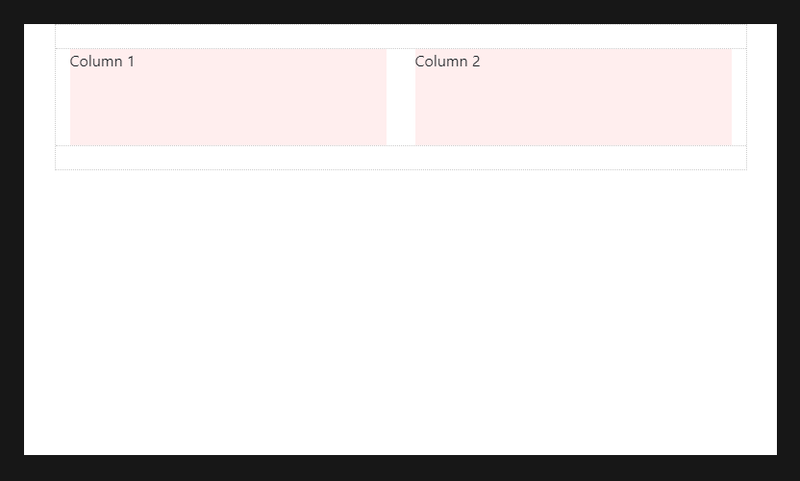 Thanks to Flexbox, Bootstrap 4 has a new “Auto-layout” Columns. These unit-less columns give you even more flexibility when it comes to designing layouts. 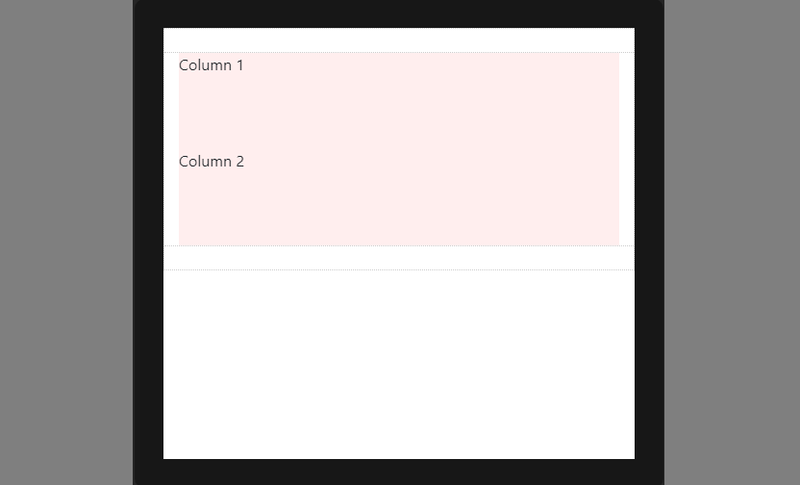 Now you know how to use Columns to create a horizontal layout. But wait, there’s more! Let’s talk about some fancier things Columns can do. Did you know that, Column width can change depending on screen width? This is called Responsive Design, and I will tell you exactly how it works a very soon. But, first things first, I need to finish telling you about Columns. Remember before when I said “It’s okay to use more than 12 Columns in a Row”? How to Responsive Design with Bootstrap. Grid Tiers, Media Queries and Breakpoints, Oh My! I’m not done talking about Rows & Columns yet, because they’re the star of the show when it comes to Responsive Design. Bootstrap 4 has 5 Responsive Tiers (a.k.a. “Breakpoints”) that you may have noticed in some of the previous Column examples (ie; col-lg-4, col-md). Aside: Why did I put (xs) in parenthesis, and not the other breakpoints? Since xs (extra-small) is the default breakpoint, the -xs infix that was used for Bootstrap 3.x is longer used in Bootstrap 4.x. So instead of using col-xs-6, it’s simply col-6. Bootstrap uses CSS media queries to establish these Responsive Breakpoints. They enable you to control Column behavior at different screen widths. This is because (xs) is the default or implied breakpoint. Since I didn’t specify a default Column width, the 50% width was only applied on 768px and wider for the sm breakpoint. Larger breakpoints, override Smaller breakpoints. The Bootstrap 4 auto-layout columns also work responsively. Because of their simplicity, I prefer them over the classic 12-unit columns. 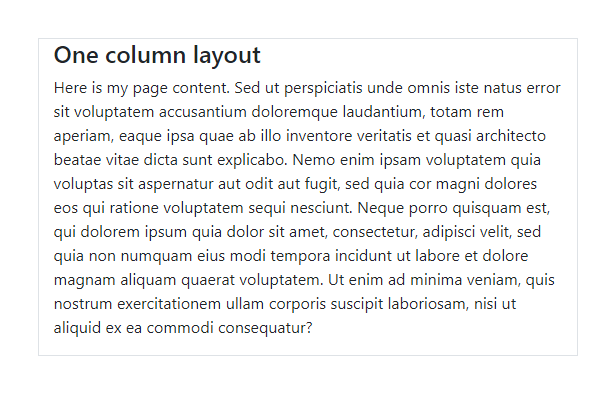 The auto-layout columns are perfect for any layout scenarios where equal-width columns are required. But, don’t forget, the 12-unit columns can be mixed-in as needed. Remember, you can switch out sm for whatever breakpoint (md,lg,xl) is needed. Columns will stack vertically (and become full-width) at the smaller screen widths unless you use a specific col-* class in your HTML markup. Use a specific col-* to prevent that vertical stacking. The smaller grid classes also apply to larger screens unless overridden specifically for larger screen width. So, <div class=”col-md-6"></div> is effectively the same as <div class=”col-md-6 col-lg-6"></div>. Therefore, you only need to use the class for the smallest width you want to support. Rows are display:flex, and therefore Columns are equal height in the same row. Use auto-margins or Flexbox align-items and justify-content for horizontal or vertical alignment (centering, bottom, right, etc..). Change some aspect of the look or styles__ color palette, fonts, border widths, etc..
Change some functional aspect__ change breakpoints, increase the gutter width, or add more grid columns. Extend Bootstrap__ add new colors, breakpoints and extend other existing Bootstrap classes. Note: There’s no need to use !important in the custom CSS, unless you're overriding one of the Bootstrap Utility classes. CSS specificity always works for one CSS class to override another. If you’re familiar with SASS (and you should be to use this method), you can customize Bootstrap with your own custom.scss. There is a section in the Bootstrap docs that explains this, however the docs don't explain how to utilize existing variables in your custom.scss. The overrides and “customization” are defined in a custom.scss file (you can name it whatever you want) that is separate from the Bootstrap SASS source files. This way any changes you make don't impact the Bootstrap source, which makes future changes and upgrades much easier. 2. In your custom.scss, import the Bootstrap files that are needed for the overrides. (Usually, this is just variables.scss. In some cases, with more complex cutomizations, you may also need the functions, mixins, and other Bootstrap files.). Make the changes, then @import "bootstrap". It's important to import Bootstrap after the changes. 3. Build with SASS. The CSS output will contain the custom overrides! Don’t forget to check the includePaths if your @imports fail. For a full list of variables you can override, see the variables.scss file. There are also these global variables. Remember, with SASS you must @import “bootstrap” after the customizations in custom.scss to make them work! Once the SASS is compiled to CSS (this is done using a server-side SASS compiler/processor), the resulting CSS is the customized Bootstrap. 1_ First, when the custom.scss file is processed using SASS, the !default values defined in the bootstrap/variables.scss. 2_ Next, our custom values are set, which will override any of the variables that had !default values set in bootstrap/variables.scss. 3_ Finally, Bootstrap is imported (@import "bootstrap") which enables the SASS processor (A.K.A. compiler) to generate all the appropriate CSS using both the Bootstrap defaults and the custom overrides. Customization is important since not everyone wants that overly recognizable Bootstrap look. How to Create Custom Bootstrap Themes. As I explained before, customizing Bootstrap is a matter of finding the correct Bootstrap SASS variables to override, and re-building Bootstrap with a SASS processor. To make Bootstrap customizations easier, I built Themestr.app__ a custom theme builder for Bootstrap 4. 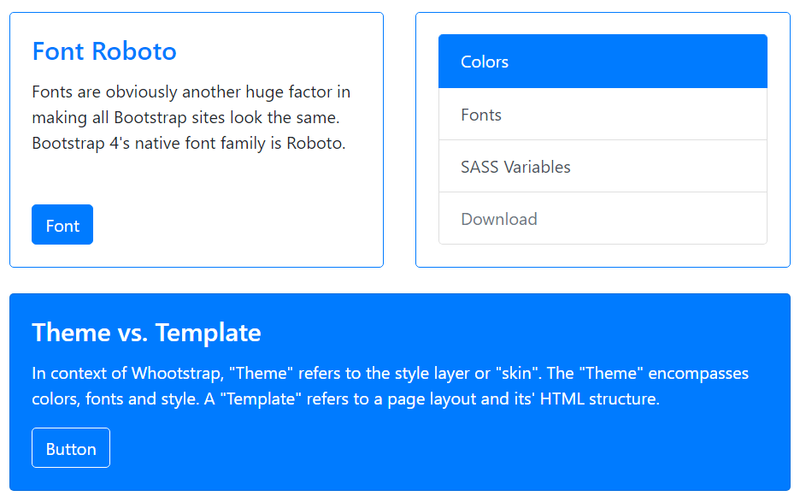 If you want to create your own Bootstrap themes, but don’t know SASS, try it. The whole idea of Themestr.app is to make the Bootstrap customization process easier, and allow you to visualize changes along the way. It includes starter themes to instantly give your projects a unique, “non-Bootstrap” look. You can change the fonts, colors and many other custom variables based on Bootstrap SASS. When you’re done, download the custom SASS, or the complete CSS for the custom theme. If you choose to use the SASS customization method explained above, what Themestr.app produces is the custom.scss with all of the appropriate SASS variable customizations. Here are the Bootstrap tools mentioned in the article. You’ll want to bookmark this list of must-have Bootstrap resources. There are many other Bootstrap resources out there, but the ones I’ve listed above are the most useful, maintained and up-to-date. Beware: Many Bootstrap 4 tutorials and articles, like those on ⛔W3schools, are full of misinformation and poor guidance.